With increased fears of a sell off ahead, as many have been giving high probability to a "double dip recession", I have decided the way I am going to play this market is with short term vertical call spreads on specific index ETF's, while lightening up on several of my largest holdings. I plan on using this strategy until we get a correction and I decide stocks (for the longer run) are worth purchasing again, or until I actually see the economy improving. As recently posted on my blog, I am afraid we could see a sell off after Labor Day, as more trader's realize this market is just too overbought, and decide to either (A) take profits or (B) short the market. I have been overweight in financial stocks (mainly Goldman Sachs and Bank of America) for sometime, and on Friday I decided to take profits on the rather ugly economic data before the extended weekend. However the market has made a fool of me recently, as I have written several call options on stocks for too low of a strike price, premium, or combo of both. I decided to take profits as it never hurt anyone, but in reality this market could continue to run... I mean there is still a ton of cash sitting on the sidelines, but as we all know it only takes a few ugly statistics or stories to start another wave of selling. I feel the best way to play this "toppy" market is to play with limited capital in the case another large sell off occurs, while capturing the majority of a continued move upward, so in this post I'll outline one option strategy which I used to trade into three major index ETF's, the Dow Diamonds (DIA), PowerShares QQQ (QQQQ), and the S&P 500 SPDR (SPY) on Friday. This post involves the use and knowledge of stock options, to learn more about this strategy, and stock options in general click here. I am still long several stocks including Goldman Sachs (GS) and Bank of America (BAC) as I have call options written on them, but the calls written on them will also help pad any losses incurred from a sell off, but I traded out of many shares of both Friday. SPY Detailed Option Trade: Using the S&P 500 SPDR (SPY) I purchased in the money September 30, 2009 $96 strike call options (note it is the later expiration on this ETF and not the normal options expiration which is September 19). This current option is trading at delta .865 which means it will capture the majority of the move up/down (86.5%, but will change as price changes), but is trading at less then one fifteenth of the ETF share price. Each option contract was $560 at the time of purchase, but the ask as of Friday's close is $655 per option contract. Assuming a greater than 5% move up in this ETF will not occur by September 30, 2009 I decided to reduce my contract cost slightly by selling the September 30 $107 strike option against it. I was able to receive $39 per option contract which reduced my per contract cost by 7% but also limited my upside to 107 per share. The maximum I could lose from each contract is $521, but in the event a sell off greater than 5% occurs by September 30 options expiration this would have been a wise move, as the share price would decrease by more than 5.21 points. If the S&P 500 rallies more than 5% by September 30, putting the 107 strike call option in the money, I would return more than 96% from my position in less than a month. To better understand options in general, including this strategy, these percentage calculations, and other option strategies click here. These are just examples and are not recommendations to buy or sell any security; if you're more bullish/bearish, you’ll want to adjust the strike price and expiration accordingly. Based on this data from the past 10 years, September seems to be a very ugly month for the stock market. The S&P 500 has finished the month of September down 6 of the last 10 years for an average of -3.86%. With this September following a near 50% increase in the S&P 500 since early March, I'm looking to get pretty conservative on the shares I still hold. I have heard nothing but mixed opinions from the professionals on where they think the market may be heading, some very bullish and others very bearish, therefore I am not selling my shares, as they may still have some upside left (S&P gained an average of 1.92% during the same time frame when it traded higher for the month of September), but I have been selling higher strike covered calls on many of my stocks to get some premium and protect my profits. Selling a higher strike call option will allow me to capture profits on the underlying until the strike price of the option is reached, and offset some losses in the case a sell off occurs. In the event of a sell off, selling covered calls will hedge to the downside (with the premium received). Selling higher strike calls on my shares is ideal for this type of speculation, which is why I have decided to outline 30 ideas for the September options expiration, one for each of the top 25 stocks listed in the S&P 500 and 5 very popular high beta stocks. To learn more about this strategy, and stock options in general click here. To understand the table, I will give a detailed example of Apple (AAPL) below. Sell the Apple out of the money September 170 strike call option. The premium received from the call option would give a downside protection of 1.72%. If the stock is assigned at options expiration on September 19, 2009 the total return from this position (assumes the buy/write option strategy was used) would be 3.80% in 15 days. A more bearish approach would be to write out the in the money Apple 165 Call option. This approach would protect to the downside 3.15%, and if the stock is assigned at expiration it would return 2.23%. The September options expiration is 15 calendar days away, so it may be best to monitor the position and buy back the call option on weakness of the underlying stock, if the stock rallies after it is purchased back, write it back out for a higher premium etc... Writing stocks out before the weekend will take some premium away from these option contracts as well, which is another positive to being the seller of these options. The stocks listed below are ranked in order from greatest to least market cap. All data as of market close Thursday September 3, 2009. To better understand options in general, including this strategy, these percentage calculations, and other option strategies click here. As an owner of Bank of America, Citigroup, Goldman Sachs, and Palm shares, I've written them out for a variety of strikes for September expiration for large premiums on higher levels of implied volatility and purchased them back on weakness and this alone has lowered my cost basis on these shares greatly. Currently my Palm shares are not written out, but I expect to be writing them out on increased levels of implied volatility just before earnings are released this September. I never write all of my shares out at the same time in case the market continues to rally; shares can be written for higher strike, higher premium, or even a combination of both. If we get a pullback, market volatility should increase, causing even out of the money call options to bring premium (this should make sense: as with higher volatility strike prices have a greater probability of being reached). Disclosure: Long BAC, C, GOOG, GS, PALM, PFE, Short BAC September 18 and 19 Call options, C September 5 Call options, GOOG September 490 call options, PFE September 17 call options. Many financial stocks have been in the spotlight in the past week, as rumors have caused them to sky rocket. I am sure you are quite familiar with them, as you've read about or watched their ticker symbol scroll by, but to mention four of them they are: American International Group (AIG), Citigroup (C), Fannie Mae (FNM), and Freddie Mac (FRE). Citigroup has not rallied nearly in step with the other three mentioned over the past week, but has had a much later rally than many of the other large financial names. I am very skeptical of these names climbing so fast recently, and although I don't usually purchase and hold put options overnight (or call options for that matter, I use them frequently but usually trade out of them by market close), I have made an exception as I have purchased put options for American International Group (AIG) for the September 45 strike. I am bearish on the financial stocks in the short term, but extremely bearish on AIG. I am expecting a continued sell off, and I think a sell off will hit the financial sector the hardest as mentioned in Are Financial Stocks Especially Overpriced? Some Protective Ideas. Financial stocks; too fast, too soon? Looking at the first Heatmap below, we can see that financial stocks are up more on average than any other sector in the past month (and the most since the market bottom in early March - not shown). 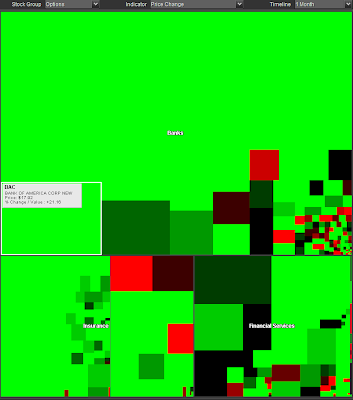 The majority of the box is the brightest level of green (the brightest level green indicates a 6% or greater increase in the stock, and the brightest level red indicates a 6% or greater decrease in the stock. See the Heatbar below the first Heatmap to get a detailed definition of colors % gain or loss). I have highlighted one of the larger market cap stocks JPMorgan Chase (JPM) to give an idea of how to read the Heatmap. The map is comprised of many different stocks, the larger the box the greater the market cap. As you can see JPM is just one of many stocks which traded higher than 6% in the past month from the financial sector. 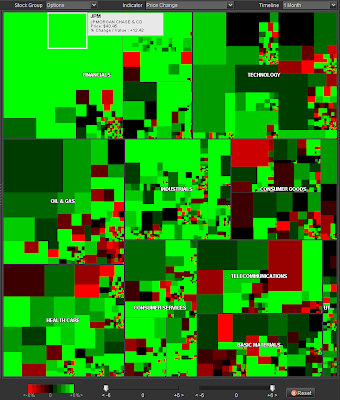 The second Heatmap below is a zoom in of the financial sector, and although it may look like only a few different financial stocks (due to identical colors), it is the entire financial sector (stocks included are the financial stocks which which have options available to trade). I have highlighted Bank of America (BAC) to show just one stock which is up greater than 6% in this period. We can see the financials are extremely over heated on a 1-month basis, so if the market continues to sell off, I believe the financials will suffer the most. The strategy below will certainly help hedge against any financial positions or can be used as an all out speculative play if one is very bearish on the financial sector. The strategy below requires the knowledge of stock options, to learn more about this strategy, risks, pricing, calculations, other strategies, and options in general click here. I have opened a diagonal put spread using the Direxion Daily Financial 3X Bull (FAS). I purchased the January 70 strike put options and immediately sold some October 50 strike put option against them. The January 70 Put option contracts were $1,800 a piece, and the October 50 strike put option contract was trading for $265 per contract (at the time of sale) making this spread net long $1,535 per contract. If the financial sector continues to sell off resulting in FAS to be at or below 50 at October options expiration, this position will help hedge my financials by returning 30.3%. If FAS does not trade below this level at October options expiration I will sell a similar put contract for the month of November. I have some Januray put option contracts which I have not completed a diagonal put spread on, but will look to do so on continued weakness, perhaps even for the September options expiration. I am long several financial stocks, therefore using this strategy will help me hedge against a sell off. I feel this is a much better strategy than going long the the Direxion Daily Bear ETF's such as the FAZ or BGZ, as increased levels of volatility cause these funds to decay over time as blogged about here. The FAS is a very hard ETF to sell short for this reason (decay), therefore premiums may be a bit overvalued at times. Longer dated put options on the FAS tend to hold their value compared to longer dated call options on the Direxion Daily Financial 3X Bear (FAZ), once again because they decay with increased levels of volatility. As of now it looks like we will kick off September to a positive start, but it is very early yet and a lot can change by market open, and month end. September is not historically a great month for the bulls, however when September is positive the DOW trades higher by an average of 3.1%. As of now the futures are currently up across the board with the S&P 500 up 3.1 points, NASDAQ 100 up 5.25 points, and the Dow Jones futures up 27 points. I am expecting a sell off to start this month and the volatility to rise. I am hedged with longer dated October 30 strike VIX call options. I will look to add to my position if the market continues to rise and the VIX trades lower, as I've stated several times; a minor sell off in the stock market could cause these VIX options to be very profitable due to the large amounts of implied volatility on the VIX. Happy trading readers, hope September will be even more profitable than August! In this post is a list of 13 stocks that I'll be keeping an eye on for the week ahead. All of the stocks mentioned in this post are stocks which have broken out to the upside on unusually large volume. The table below shows the company, ticker, Friday's per share % increase, and Friday's volume increase (% increased compared to 50 day average). Many of these stocks are up big on earnings announcements, therefore it may be a good idea to wait for some profit taking and purchase the stocks on weakness. The stock which is most attractive to me this week is Tiffany & Co (TIF). Below is a trade idea which I may be using in the week(s) to come. To learn more about the risks, pricing, calculations, strategies, and options in general click here. Tiffany Trade Idea: I have been looking to get long Tiffany stock for my investment portfolio for some time now, however it ran too fast and I feel I have missed it. I am not going to chase it, because I feel some profit taking could occur before it moves higher, therefore I will be using the strategy outlined below. As stated previously I don't mind owning Tiffany shares, but at a lower price, so I will be selling naked put option contracts for the October 34 strike. The current theoretical premium received is $1.00 per option contract, with that premium I will use it to make an all out bullish bet on Tiffany by purchasing out of the money November 45 call options for $50 per option contract. If the stock happens to sell off and expire below 34 a share at October expiration, I get my shares and my cost is $33.50 per share or 10.83% lower than Friday's close price. If the stock continues to climb higher, moves lower but by less than 4.57 points, or happens to move sideways over the next 47 calendar days I will bank 100% of the premium ($50 per option contract). In the case that the stock continues rising the call for November options expiration will also rise allowing for more profit on the long side. I use this type of option strategy as a way of setting limit stock orders. This strategy will allow me to participate in Tiffany's stock instead of sitting on the sidelines waiting for the chance to purchase it lower. It also allows me to capitalize on an upward move by purchasing a longer dated out of the money call option, which would be paid for in full by the premium received from the put sold. I decided to choose the higher strike longer dated November options, because I believe they will benefit from increased sales speculation going into the holidays (December options are not yet available), which may drive Tiffany shares higher... Let's face it that blue box sells!